Lamb and potato chips may sound like worlds colliding, but the salty crunch of the chips makes an excellent coating for the deeply flavored meat. Serve this dish when you want to impress. No one will need to know how easy it is to make or what the secret ingredient is. Pulse the pine nuts and potato chips in a food processor until the size of breadcrumbs. Transfer to a medium bowl, and add the garlic, rosemary, 1/4 tsp. salt, and 1/2 tsp. pepper. Transfer the lamb to a roasting pan or broiler pan, coated side up, and roast, shielding the crust with aluminum foil if it browns too quickly, until medium rare (125°F), 25 to 35 minutes. Transfer to a cutting board, tent loosely with foil, and let rest for 10 minutes before slicing. In a small saucepan over medium heat, combine the port, demi-glace, and 1 cup water. Bring to a boil, and then reduce to 2/3 cup, about 10 minutes. When reduced, lower to a simmer, whisk in the butter, and season to taste with salt and pepper. 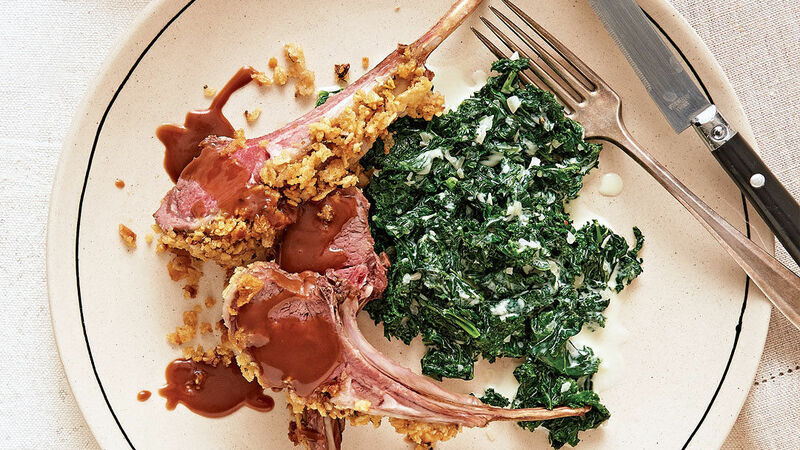 Slice the lamb into chops, and serve with the sauce. Look for demi-glace where you find broth; we like the More Than Gourmet brand.